Anyone who’s used email templates on a regular basis will appreciate just how handy they are. For busy professionals they’re a lifesaver, reducing the amount of time it takes to compose the same message over and over again to send out to business contacts and sales leads. Email templates are about freeing you up to focus on more important tasks, which is why we’re updating our free Gmail Email Templates extension for Google Chrome with additional features that will let team leaders share their email templates with their team. 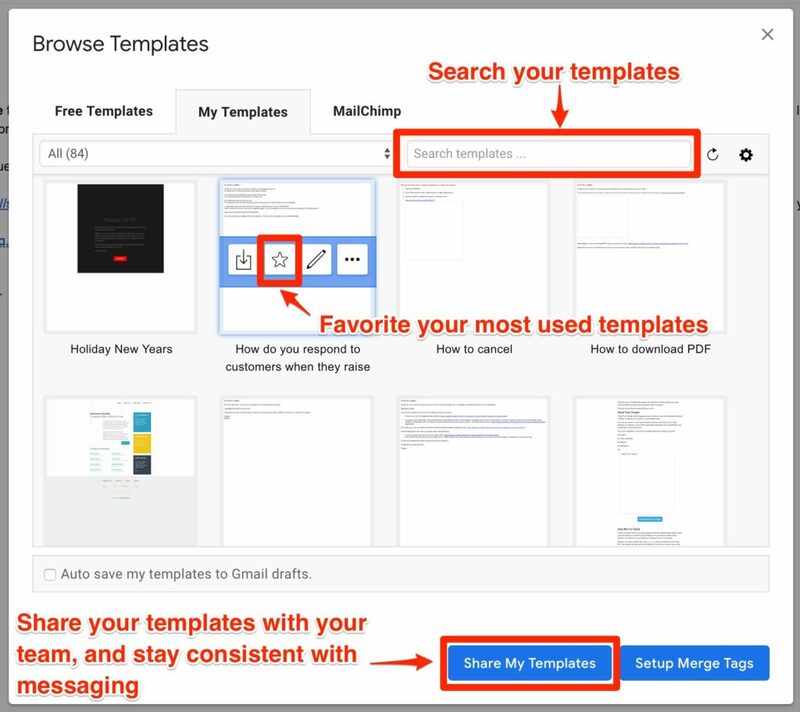 What’s new in Gmail Email Templates? Gmail Email Templates is a free extension that provides easy access to a library of over 100 email templates designed for consistent email signatures, letterheads, sales pitches, newsletters, invitations, events and more. And of course, in addition to the pre-existing templates that you can edit, you can also design your own templates from scratch in Gmail Email Templates‘ HTML editor, or import your previous templates from MailChimp. This was high up on our list of demands by all of our email template customers, so we’re extremely excited to offer it to you today. Team leaders wanted the ability to edit email templates, share them with their teams, and more than anything, keep tight control over who has access to specific email templates. For example, salespeople, marketing, or customer service representatives could benefit from linear company branding and messaging. Whoever you shared your templates with will not be able to re-share your templates with any other colleagues, providing you with tight control over who has access to the kind of messaging that you specifically want them to use. One of the most useful tools in Gmail itself is the ability to “star” important messages so you can quickly find them when you need them. Now we’re adding this popular feature to our own Gmail Email Templates extension, so you can access the templates you need from a simple drop-down menu instead of opening a larger window to browse through your full selection. Starring a template is simple: just click on “Browse Templates,” search for the one you want to star, and select the box in the middle to add it to your favorites. To access your starred templates, simply click on the “Compose” button to open up a new message window, then hit the small icon next to the “Send” button to access your email templates. There you’ll see your list of starred templates alongside those you’ve most recently used. If you’re looking for a particular Gmail template that you haven’t starred, you can make use of our new search tool to save yourself time. Open up the template-browsing window and you’ll see we’ve added a handy search bar at the top—simply begin typing the name of the email template here, and it will show up at the top of your list. Give it a try today, and start saving time while you watch your company scale at an unprecedented rate. Share it: Gmail templates are great for marketing, sales, invites, or simply for looking more professional. But in our increasingly mobile world, they’re a . . .
Share it: Holding an open house? A recruiting event? A one-day sales event? Send your invite emails as you normally would. But for your . . .